Pioneers in the industry, we offer 4 wire low resistance standards and high resistance jigs 1000 ohms from India. 4 Wire Low Resistance Standards is designed to calibrate Milli Ohm Meter, Micro Ohm Meter, Low Resistance Meter etc. Resistors are placed in MS house. They have excellent accuracy stability. All the resistors have Low TCR can handle high test currents as per specifications. This jig serves as excellent calibration standard at a competitive price. 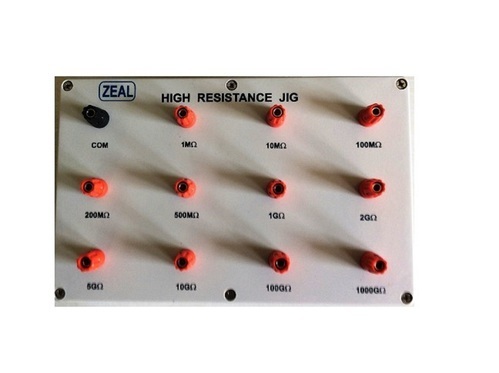 High Resistance Jig is designed to calibrate Insulation Resistance Tester, Mega Ohm Meter, Giga/Tera Ohm meter, High Resistance Meter, Megger etc. Resistors are placed in ABS plastic house sealed so that moisture dust cannot enter and hamper the stability. All the resistors can handle test voltage up to 5000 VDC. Looking for “High Resistance Jigs”?